(CNN) -- Thousands of taxpayers across the country aren't getting their refund or stimulus checks because criminals have stolen their Social Security numbers in an identity theft scam, CNN has learned. Some victims don't learn about identity theft until the IRS questions them about income in their name. "We see a lot of activity right now, because clearly folks who are trying to perpetrate a fraud have to get their claims in early before a true taxpayer files their return," said Nina Olsen, the national taxpayer advocate for the Internal Revenue Service. Olsen, whose independent office is set up to help taxpayers, said her office fielded several thousand complaints this year connected to the scam. The Federal Trade Commission reported that approximately 50,000 taxpayers complained about tax fraud and employment-related identity theft during 2006, compared with 18,000 in 2002. "It's a huge nightmare," Olsen said. "Basically, their life can be taken over by just about every approach, trying to prove that they are who they are and other people are not. And when you think about how central the Social Security number is to banking, to credit, to school applications, for financial aid, just for everything you can think of -- plus your taxes -- it has a significant impact on a person's life." That's what happened to Brenton King, a 25-year-old father and student from Orem, Utah. King said he was 17 when someone stole his wallet at a ski resort. Over the past four years, at least five people have used his Social Security number to report income. And since the criminals earned income on his number and never paid taxes, he and his wife, Jennifer, can't get any tax refunds from the IRS or their government stimulus check even though he reported the theft several years ago to police and the IRS. Under the government's economic stimulus plan, 130 million people were supposed to received tax rebate checks from $300 and up last year. "We want to put that money in the bank," Jennifer King said. "We want to be able to put money down on a home." The Kings said the ordeal has been frustrating because they know when they file their tax return every year that they won't get the money back that they are owed. Initially, they said, it was difficult dealing with the IRS, which they said made Brenton feel as if he were the criminal. "The fear is it will happen for the rest of our lives," Brenton King said. Sen. Max Baucus, D-Montana, said it takes the IRS an average of about a year "to sort out who is the real taxpayer." "In the meantime, the victim's tax accounts get frozen," Baucus, the chairman of the Senate Finance Committee, said in a written statement. "The IRS issues no refund. The money that the taxpayer was planning on doesn't come. The taxpayer waits in tax limbo, for months and months." Baucus, who led a hearing into the issue in 2008, said other taxpayers don't learn that they are victims of identity theft until years later. "Victims first realize that other people are using their identities when the IRS contacts them. 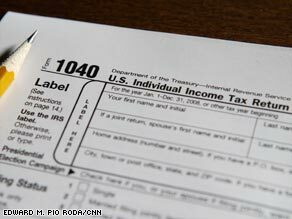 The IRS asks them why they did not report the income that appears on W-2 forms with their names on them," he said. And Sen. Chuck Grassley, the ranking Republican on Baucus' committee, said the IRS doesn't do enough to combat tax-related identity theft. He said the IRS does not prosecute, "and that's not very helpful. It sends a signal that you get a free pass if you're using IRS instruments." But IRS spokesman Dean Patterson called preventing identity theft "a top priority" for federal tax collectors and said, "we are committing significant resources to address the challenges posed in protecting taxpayers' identity information." "We have established a special unit dedicated to resolving tax issues incurred by identity theft victims and special tracking codes to monitor returns and prevent further fraud," Patterson said in a written statement. "Potential identity theft victims can contact the IRS if they suspect fraud." The IRS said it "vigorously prosecutes identity thieves to the fullest extent of the law using tax-related laws that result in the toughest penalties possible." The agency said it was unable to provide details of how many cases it prosecuted, however. In the meantime, the Kings have signed up with Lifelock, a private company that helps identity-theft victims. Todd Davis, the company's CEO, said cases like theirs are "like getting a disease that's incurable." "Look, once your information has been compromised, it's not like when they steal your car," Davis said. "Once they steal your car, you file a police report, you do an insurance claim or whatever it may be, you get your replacement car, it's over. Once they have your personal information, as exemplified by this couple in Utah, this information could be used over and over by multiple people."